Emotionally troubled youth present a powerful repertoire of emotional and behavioral difficulties. They are often misunderstood. This training will address the early formation of unhealthy patterns in social-emotional development and provide principles for the education, parenting, and treatment these children. Participants will understand the interface of attachment and developmental processes. They will also learn the origin and assessment of emotional and behavior difficulties and central issues that must be addressed to foster change and growth. Foster/Adoptive parents, educators, youth-workers, healthcare providers, mental health professionals, probation officers, church leaders, community leaders and individuals interested in understanding how to help children realize their full potential. Up to 6 CEU credits and OPI renewals are available for Mental Health Professionals, Healthcare Providers, Educators, Child Care Providers, and Law Enforcement. Difficulties associated with failure to master significant developmental stages and domains are often associated with insecure attachment and are compounded through childhood and adolescence. Attachment disruptions compromise normal childhood development and give rise to complex emotional and behavioral difficulties in many special needs youth. These special needs youth are often misunderstood, leading to poor assessments, misguided interventions and multiple academic and out-of-home placements that fail. Caregivers, educators and clinicians are frequently frustrated and repelled by the powerful repertoire of emotional and behavioral difficulties associated with some special needs youth. The complexity of emotional and behavioral difficulties is compounded over time and is increasingly resistant to intervention and change. Across time, these high-risk youth fail and are failed by academic and social systems that focus on symptoms and don’t understand their central issues. The developmental origins of emotional and behavioral difficulties in children. The interface between attachment and developmental processes which give rise to emotional and behavioral difficulties in personality formation. How skewed developmental processes compound and exacerbate emotional and behavioral difficulties across time. A way of seeing children that determines who we can be for them. 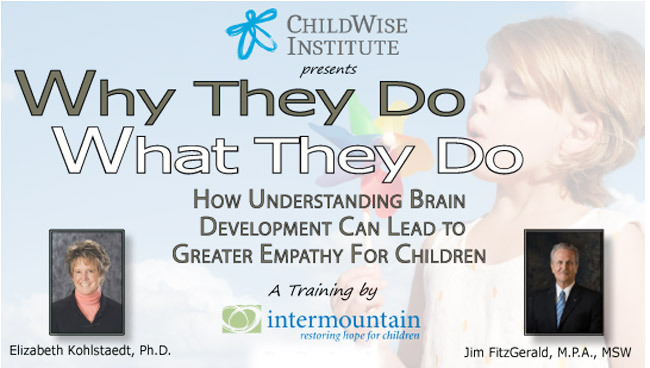 Jim FitzGerald, M.P.A., MSW, is the Chief Executive Officer of Intermountain, a nationally recognized, multi-service agency specializing in the treatment of attachment-disturbed youth since 1982. For more than 35 years, he has worked in the areas of leadership, training, program development and implementation and has played a key role in developing the nationally recognized children’s mental health agency. Jim received a Bachelor degree in Psychology from the University of California, Los Angeles and Masters in Public Administration and Social Work from The University of Montana. Elizabeth Kohlstaedt, Ph.D., is a licensed psychologist and has been the Chief Clinical Officer of Intermountain since 1990. Dr. Kohlstaedt received a B.A. in German from Purdue University, an M.S. in linguistics from Indiana University, an M.A. in physiological psychology from Arizona State University and a Ph.D. in clinical psychology from University of Montana. She has served as adjunct faculty at Syracuse University, and has trained medical, psychology, social work and counseling interns from around Montana and around the country. Dr. Kohlstaedt has appeared on Prime Time Live, National Public Radio and in the Los Angeles Times to discuss attachment disorders and has provided seminars for a variety of professionals, including judges, physicians, nurses, foster parents, case workers, clinicians and direct care staff on issues of attachment, child development and trauma. 9:00 a.m.-12:00 p.m. Brain Development, Elizabeth Kohlstaedt, Ph.D.
1:30 p.m.-4:30 p.m. Sustaining Empathy, Jim FitzGerald, M.P.A.